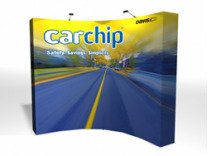 VBurst pop up trade show displays: When the VBurst is set up, the graphic unfolds with the frame and stretches to form a completely smooth image across the entire trade show display. 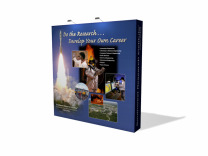 The VBurst can be ordered with or without end panels. Each graphic that is mounted on the VBurst Graphic Display has Velcro mounted to the back side of the graphic that attaches to Velcro mounted to the face of each hub. This makes VBurst the most convenient of all Portable Displays you can find. Dye Sub Graphics Travel on the Frame! 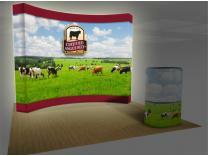 The VBurst pop up display system has taken Pop Up Displays and Exhibits to a whole new level. Not only has VBurst led the way in innovation by attaching the fabric to the frame, but it's taken the weight, and the expense out of large image displays. Now instead of purchasing a new mural for over $2,500, it can often be done for less than $1,000 which makes the cost of ownership of the VBurst truly affordable. 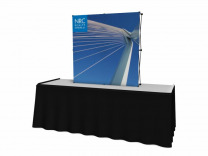 Not only can VBurst do the big full height tasks, but it can be purchased as a table top in straight or curved frame. There are also the familiar case to counter kits that pop up display owners have always loved available with the VBurst Displays as well, in addition to lights and other popular accessories. The process for printing the graphics with the VBurst is dye sublimation. The Burst and a few similar pop up display products have led the way in the trade show industry with dye sublimation, and because of the successful use with products like the VBurst, it’s now used throughout the industry with everything from lower end products to the very highest uses. 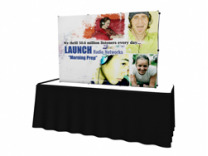 See our many VBurst kits complete with table throws and full accessories such as lights etc. in the Kit section of www.shopforexhibits.com. 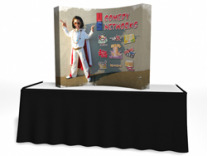 One of the leading online retailers of trade show displays, ShopForExhibits.com, continues to expand what they make available to their nationwide clientele, through their display rentals program which was begun only two short years ago, and the new tension fabric products. By launching a new state of the art web site, ShopForExhibits plans to keep pace with future growth challenges by supplying prospective customers with the knowledge and product information needed to build confidence in an aggressive online retailing strategy. Although the future is anything but certain in this place in time, great new trade show exhibit products and reasonable price points will be most important in order to conquer the challenges ahead. 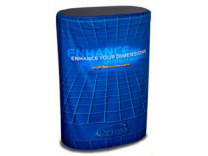 Being successful in bringing new exhibit related products to market such as the new tension fabric displays, isn't as easy as one would think, but due to their background with display products and online marketing, ShopForExhibits.com has positioned themselves to lead the pack and be a successful competitor in this industry.